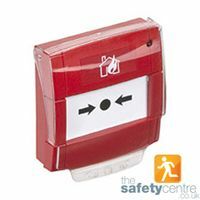 A Call Point Cover is an ideal way to help prevent accidental false alarms on fire alarm systems. The Safety Centre can supply a variety of call point covers which are suitable for use on the majority of break glass units used on modern fire alarms in the UK today. In addition to the simple call point cover range The Safety Centre can also supply a selection of call point covers or stoppers manufactured by STI Europe. These units are robust products ideal for sports halls and areas where a break glass may be hit. STI Europe also manufacture their Stopper range with inbuilt sounders which alarm when the call point cover is lifted. This is a fantastic way to prevent malicious alarm activation as it draws attention to the person lifting up the call point cover. These units are particularly useful for schools and public buildings. Products such as the KAC Call Point Cover can also be used on their older break glass units. This means that the product is backwards compatible with older units.